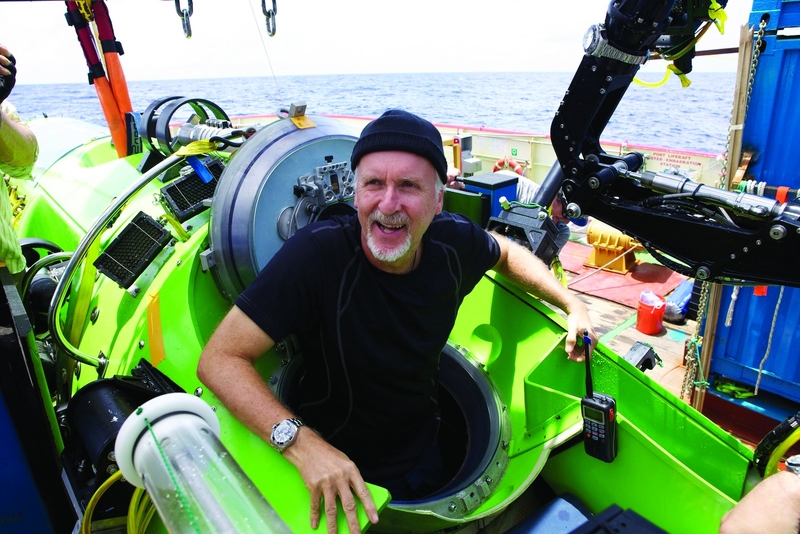 At 1.59pm on March 25, 2012, Hollywood film producer James Cameron became the first person to tweet from the bottom of the ocean. ‘Just arrived at the ocean’s deepest point,’ he wrote from inside his sub, the Deepsea Challenger. ‘Hitting bottom never felt so good.’ Four hours later he emerged on the surface, dishevelled and grinning, after a record-breaking feat. Within hours, and barely enough time to let his achievement sink in, Cameron had disappeared again – this time to London for the premiere of his film, Titanic 3D. The world was astounded by his vision and bravery, and the media went into frenzy. Meanwhile behind the scenes, the unsung heroes of event were tidying away their equipment and collecting data that they would later spend months analysing. The Deepsea Challenger, which Cameron describes as a ‘vertical torpedo’, is a 24ft tall vessel that is only 43 inches wide. The sub was designed to go to the Mariana Trench, a 1,500-mile-long scar at the bottom of the western Pacific Ocean. It achieved this last year, taking Cameron to the deepest point on Earth under crushing pressures, freezing waters and constant darkness. It’s an environment that no test facility in the world could fully replicate and the role of simulation was critical the Challenger’s design. Durbin’s company, Tasmania-based Finite Elements, was brought in to use its expertise in computational fluid dynamics (CFD) and finite element analysis (FEA). The simulation tools not only designed the sub, but also helped develop a 140 MPa fully forged pressure vessel- one of the largest high pressure chambers in the southern hemisphere- to test components. One of Durbin’s proudest achievements is in developing the patented syntactic foam for the backbone of the structure. Deep-sea exploration submarines are usually built with a metal frame with foam attached. But Cameron wanted to explore using foam as the structural backbone to save weight. A commercial flotation foam, made from epoxy resin and hollow glass micro-bubbles, was sent from the US but cracked during pressure-testing. Durbin and fellow engineer, Ron Allum, set about designing their own. The team wanted to improve the packing density of the bubbles and create a resin base that would produce toughness in the brittle material. They used Ansys Structural Mechanics software to research how the hollow glass spheres interact within the foam matrix. They found that when the epoxy cures, it releases too much heat, which damages the foam. They then used Ansys Transient Thermal Modelling to understand the process and implement manufacturing changes. After months of simulation-assisted trial and error, a new flotation foam was developed. Meanwhile the pilot capsule was found to have a number of design complexities. For example, the holes that accept the electrical cable penetrators into the pilot capsule would have collapsed under pressure. An improved geometric design that managed the stress vectors and the addition of an ultra-high-strength alloy steel for the penetrator plate overcame the problem. ‘The pilot capsule looks like a simple sphere, but there are a lot of subtleties in its shape to make it work’ said Durbin. ‘You can’t afford to have a sudden collapse of even the most minor component at those depths. The high pressure water could cannon into the collapsed low pressure area and the resultant shock wave would likely cause a fatal collapse of other essential components and even the pilot capsule’. Another challenge was shrinkage of the craft, which was at around 70mm in overall length due to the pressure exerted on it by the ocean. Each component deforms at a different rate as the craft descends and the team had to make sure that the size changes of the mating parts were consistent. Durbin used Ansys Mechanical to track size changes and design the fastener systems capable of the necessary compliance. These fasteners held key components, such as battery modules, thruster modules and the pilot capsule, to the structural backbone of syntactic foam. The result was a submarine design unlike any other that took Cameron to a formidable frontier, unexplored by man, and rivalling anything he could create in his films. The faith he had in the Challenger is testament to the skill of the engineers involved in the project. Cameron claims that ‘Imagination feeds exploration…You have to imagine the possible before you can go and do it.’ Engineers today are able to bring their imagination to life, in all its complexity, in the virtual world. With increasingly powerful simulation tools, the Deepsea Challenger is just the beginning of what could be achieved. Err this was first done 53 years ago, why no mention of Piccard in Triest? Other useful information can be found on the National Geographic Site – search for DeepSea Challenger. Also finiteelements.com.au is updating their website to include this project. Keep an eye on this site over time as information is roled out.